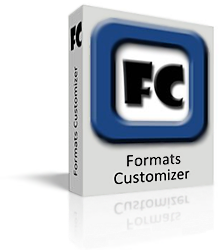 Formats Customizer is a utility for your computer that extremely simple to use. Its purpose is saving you time anytime you use frequent actions such as Save and Open for documents as well as Import or Export for files. It is a simple, easy to use and comfortable program with an intuitively clear user interface. 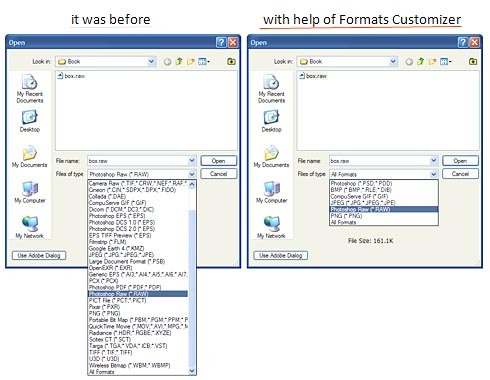 How does the Formats Customizer help to save time? Download the installation package. The master installation will assist you to install the application easily and simply. 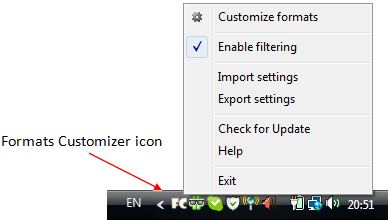 When you will launch the Formats Customizer the application icon will appear in your system tray. To access the Formats Customizer icon menu right click on the application icon. From the Formats Customizer menu you will be able to select the exact file types that you would like to use with each associated application. 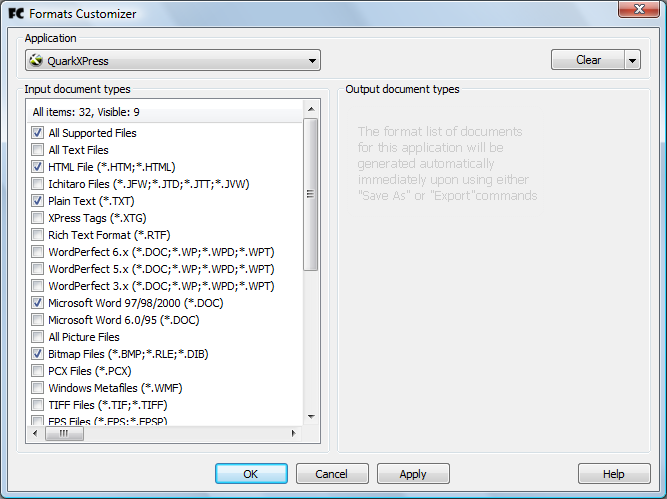 By selecting the application via the drop down menu, you can pick the exact file types to hide to speed up your work. 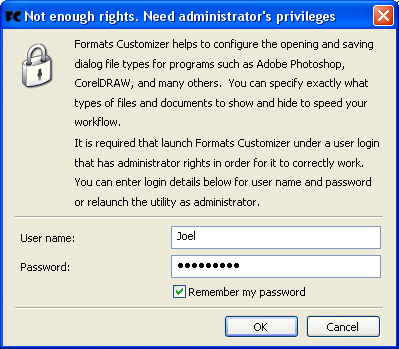 You can select the applications from the left side of the dialog box, and the file types from the right for each program that you use. This allows you to determine which file types to show when you use Open, Save As, Import or Export. Anytime you like, you can quickly and easily change the default file types that will be displayed when using Formats Customizer. Upon making changes, they will be visible immediately the next time you use Open, Save As, Import or Export. If you want to disable file type filtration, so that you see all available file types again, simply click on the Application Icon in the System Tray and uncheck Enable filtering, to enable filtering so that only your desired file types are visible, simply recheck Enable filtering. The icon of the Formats Customizer in the system tray changes depending on status making it easy to see at a moments glance. You can synchronize settings on different computers by import and export command. Export command save all configurations to selected file. Import command read from external file only which configurations that are not empty. To work correctly, it is important that the Formats Customizer be started with administrator rights. So there are UAC is caused in Window Vista. 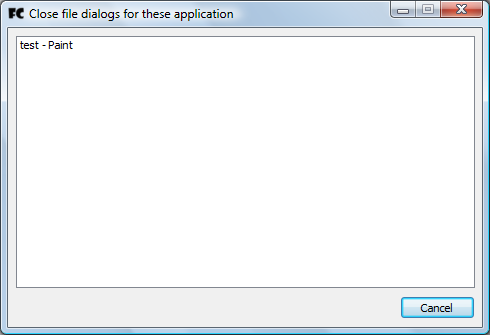 If the program is not started appropriately in Windows XP, you will receive an error window letting you know. 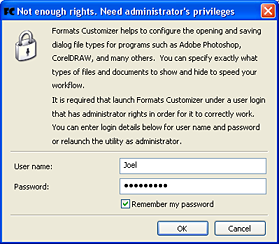 It is possible to save a user name, as well as password in the Options so that you do not have to enter them each time you run Formats Customizer. 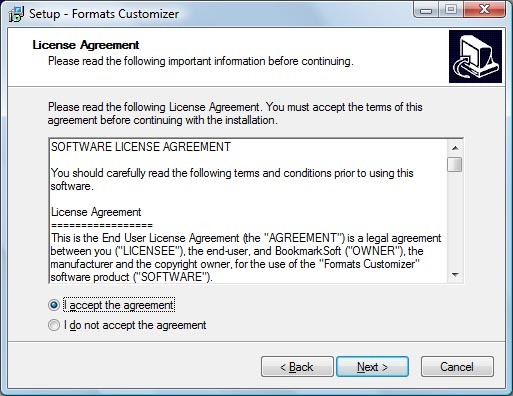 If you are not comfortable entering this information, you can alternatively launch the program with administrator rights each time you open it. 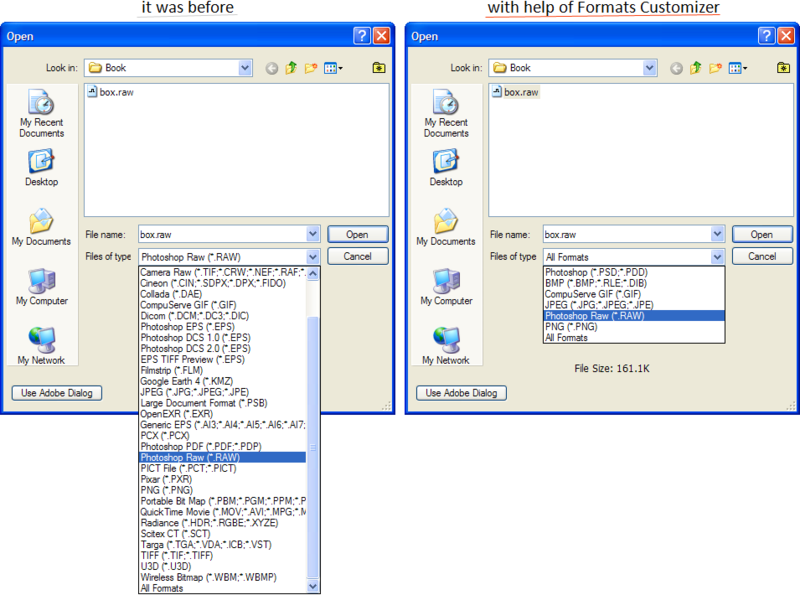 To exit from Formats Customizer simply press Exit in the menu. 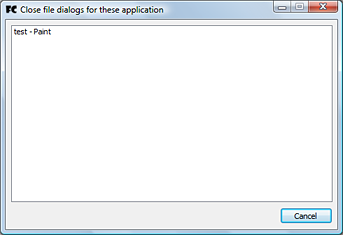 If you are in the middle of saving, opening, importing or exporting a file in one of the supported applications you will receive a message asking you to close the file dialog box and reopen it again. If you have questions, suggestions or comments on your experience with Formats Customizer, we would love to answer questions or help you with any problems. Copyright 2007-2016 Falco Software Company. All rights reserved.